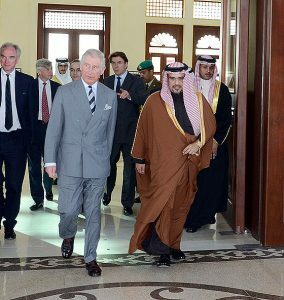 The announcement by Clarence House that Prince Charles will be visiting three Gulf countries, including Bahrain, in November has stirred the reaction of human rights campaigners, with some claiming that the visit will serve as an endorsement of the abuses carried out by Bahraini authorities. Analysts believe that Charles’s visit could be part of promoting and sealing arms deals with the Gulf States like in 2014 when he visited Saudi Arabia. During that visit to the oil rich kingdom, Britain’s biggest arms company reached a multi-billion agreement deal with Riyadh for the sale of 72 Typhoon fighters. Bahrain is a strategically located Gulf State and it is home to a British Naval base. Manama has been cracking down on protesters demanding political reforms and it has been targeting the Shia majority claiming that they want to destabilize the country and overthrow the government. A couple of months ago, it dissolved the Wefaq party, largest opposition party with Shia dominance, and also revoked the citizenship of Sheikh Isa Qassim, the spiritual leader of the kingdom’s Shias. Majority of the population are Shias but power is concentrated in the hands of the Sunni minority that enjoys the strong support of neighboring Saudi Arabia. Written by: Jaber Ali on September 21, 2016. Posted by Jaber Ali on Sep 21 2016. Filed under Gulf News, Headlines. You can follow any responses to this entry through the RSS 2.0. Both comments and pings are currently closed.